Shopify, an online payments and commerce platform, concluded their IPO this morning and began trading on the New York Stock Exchange at a $1.26 billion valuation. From three founders operating out of Ottawa to 632 employees providing services on a global scale, Shopify has achieved extraordinary growth. Shopify was founded in 2006, and raised $5.5 million in their Series A fundraising round in 2010. Prior to the IPO, the company had raised over $87.5 million over three rounds of fundraising. The company is now utilized by approximately 100,000 online retailers, including General Electric, CrossFit, Tesla Motors, and Amnesty International -- contributing to 2014 revenues in excess of $105 million. The pricing range for the IPO was initially set between $12 - $14, however the range was raised to $14 - $16 citing higher than expected interest in the offering. Continued high investor demand drove the IPO price to the top of the range, resulting in initial pricing at $17 per share. 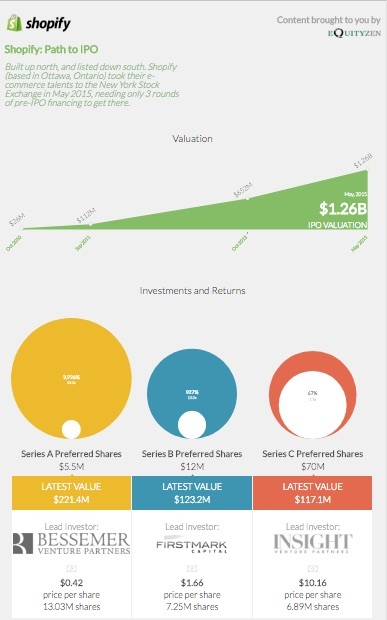 Bessemer Venture Partners, the lead firm on the Series A fundraise, notched the highest gains on the public offering with a 3,926% gain on their initial investment, made in 2010. The firm owns approximately 30% of the company post-IPO. The CEO and founder of the company, Tobias Lutke, completed the IPO with approximately 14% ownership in the company, worth just under $166,000,000 at the $17 IPO price. CTO Cody Fauser and co-founder Daniel Weinand each retain approximately 2% of the company.